Goodness me, we made the news! The Monday morning gang were up for it in more ways than one today when i wickedly sprung an outdoor adventure on them. The theme (conveniently) was facing fears. Taking it all in their stride they melted into the sun dappled grass, courageously stood defiant in warrior postures, gracefully balanced as sturdy trees and curled into cheeky camels, all under the spell of the cherry blossom trees and mountains. I feel so lucky to hang out with these amazing people! Gratitude and props to each and every one of them! 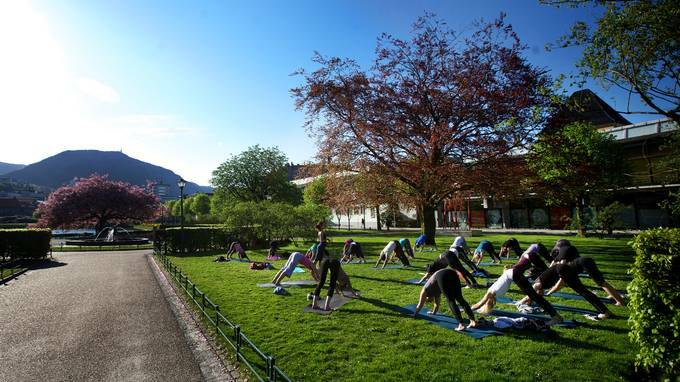 This entry was posted in #365yoga, inspiration, news and tagged #365yoga #Bergen #outdoors. Bookmark the permalink.